Hello guys, first simple animation (camera movements) with my models in Blender 2.8. My problem is that I cannot achieve that blurring effect on the fans for this particular animation. It looks weird that you can see the blades spinning at low speeds. I tried to add VECTOR BLUR under compositing but it blurs the panning of the chassis as well which is not what I needed. I just wanted the FANS to be blurred. Vector Blur doesn´t work very well with round objects that rotate around its center. Things like fans or car rims require real motion blur. At least that is my experience. I tried the MOTION BLUR tab but it blurs the whole computer casing (which makes sense), I don’t want that. Do you have any recommendation in isolating just the fans? You can disable Motion Blur per object in the object panel. At least in Cycles. Not sure with EEVEE. If the case gets blurry, lower the motionblur and speed up the fan. Use cycles motion blur. Alternately, just model them as a solid cylinder with a transparent material. 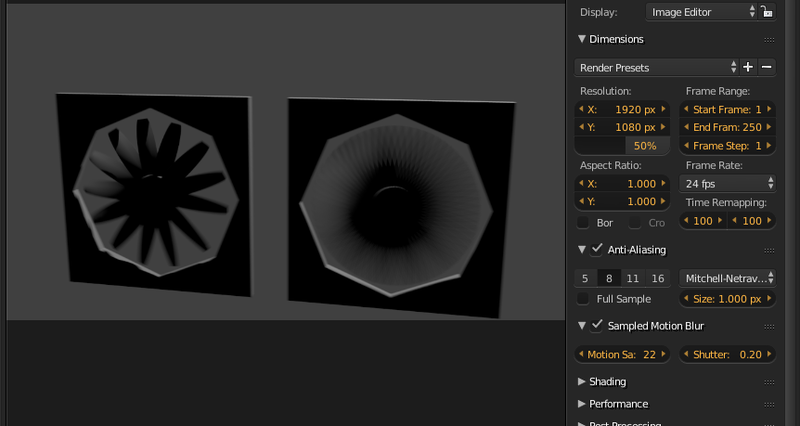 Build the motion blur into the object. at 500 rpm, with 7 blades, at 60 fps, the blades sweep the full area once a frame anyway, so if it were blurring correctly, it would blur it out entirely. It’s certainly not perfect, but if you want perfect, stick with cycles motion blur. @FinalBarrage the way i spinned the fans is rotating them 360 after 24 frames and did a LINEAR INTERPOLATION. when you say lower the speed, how do you do that? change it to 597,6 for each frame in your video. this will be the same as 2400RPM which is a common fan speed. you can do math in blender, so just type 597,6[number_of_frames] and it will give you the right value. i had time, so here is a quick demo. however, if we turn the shutter waay down, you can see there is almost no blur on the frames, and the slow moving fan moves so slowly that the blur barely has any effect. While the 2400rpm fan is moving quick enough to benefit from the blur. I strongly suggest you do some research on how to do proper motion blur in blender though, as i encountered some problems even with this simple demo. I solved it by just using a high motion sample, which works fine cause its a .5sec render time but if you do that, you may experience a x10 times longer render time. Perhaps someone who’s played around with motion blur before can help you out, i’ve never used it before. I just know how motion blur works from a cameras point of view. If you want to blur the fans, I’d just … blur them. @sundialsvc4 what do you mean by that? you cant just blur them, thats not how motion blur works. Hes planning on doing an animation, not a still image.